Thankfully, strategies exist to funnel writers’ efforts into various portions of submissions documents in a way that can avoid duplication of efforts, maximize writer-specific familiarity with certain portions of the product information, and minimize the amount of time required to complete numerous documents. The answers lie in the respective make-up of clinical study reports (CSRs), integrated summaries of safety (ISSs), integrated summaries of efficacy (ISEs) and reporting modules in new drug applications (NDAs) and marketing authorization applications (MAAs). The CSR serves as the basis for deriving submission documents’ clinical modules. Once CSRs are final, medical writers can strategically piece together components required for clinical modules in a specific order to avoid rework by working from documents requiring the greatest level of detail down to those requiring the least. When time permits, use the same group of medical writers for key CSR sections as for the submission document modules. Assign one writer each, when feasible, to modules 2.7.1, 2.7.2, efficacy (ISE plus 2.7.3), and safety (ISS plus 2.7.4). 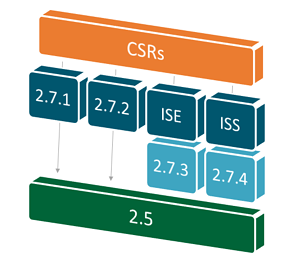 Extract the relevant ISE and ISS sections verbatim to modules 2.7.3 and 2.7.4 when possible. Assign one writer, typically the efficacy writer (ISE plus 2.7.3), to produce module 2.5. 1. Designate a document champion who will take ownership of resolving conflicting comments, protect consistent messaging, and manage version integrity. 2. Use a style guide specific to each submission to provide a concrete reminder to all reviewers regarding messaging, style, nomenclature and approved brand or product stylistic preferences. 3. Block off time on reviewers’ schedules so that their review time is reserved for your submission document. 4. Bring key reviewers to the table for a live, roundtable-style editing session to solicit feedback on key concerns and resolve conflicting advice. By utilizing a combination of writer-specific knowledge funnels, careful process planning and streamlined review tactics, medical writing teams can accomplish complex simultaneous submissions with precision and consistency — desirable characteristics for any NDA or MAA project! You can also read our advice for overcoming data analysis challenges and navigating operationally complex submissions in our other blog posts.